Covering a total area of 47,000 square kilometers, Badain Jaran Desert (bā dān jí lín shā mò 巴丹吉林沙漠) is the third largest desert in China, and the forth largest in the world. It is located in the south-central part of Inner Mongolia Autonomous Region and the North of the Hexi corridor (hé xī zǒu láng 河西走廊) in Gansu (gān sù 甘肃). 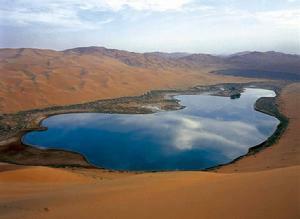 With picturesque lakes and singing sand dunes, it is a hot-spot and an ideal place for exploration. Humanoid traces (fossil remains, stone implements, etc.) from the Paleolithic ("Old Stone Age", or from about 2.6 million years ago to about 10 thousand years ago, which latter date marks the beginning of the Neolithic ("New Stone Age")) have been unearthed here, as well as the fossil remains of prehistoric members of the ostrich family (Struthionidae) and much, much older fossils belonging to dinosaurs. The aforementioned Tangut (táng gǔ tè 唐古特) tribes that resided here during China's earliest dynastic period, the Xia (BCE 2000-1500) Dynasty (xià cháo 夏朝), conducted trade with the Bactrians (BCE 2200-1700) of Central Asia (corresponding to the northern part of present-day Afghanistan, the western part of Tajikistan, most of present-day Turkmenistan, and the southern part of present-day Uzbekistan). The present-day camel of the Badain Jaran Desert is a descendant of the Bactrian camel. In more recent times, the city of Alxa (Alashan in Tangut) and the He Xi Corridor formed part of the northern route of the ancient Silk Road. The Tang (CE 618-907) Dynasty poet, Wang Wei (wáng wéi 王维), wrote couplets on the subject of Alxa, and even the renowned Italian traveler and explorer, Marco Polo, left his own personal "Kilroy Was Here" on Alxa in the form of mention of Alxa's merits in his travel diaries. Later, Badain Jaran was occupied by the Mongols, and in particular, by nomadic desert tribes such as the Tuerhute (tǔ ěr hù tè 土尔扈特) and Heshuote (hé shuò tè 和硕特), who were excellent horsemen. Foreign and Chinese Archeology teams have unearthed numerous finds of stoneware pottery lying around the perimeter of the desert's many lakes, highlighting the importance of the lake as a site of early human habitation. Some of the later period pottery unearthed here had been painted. 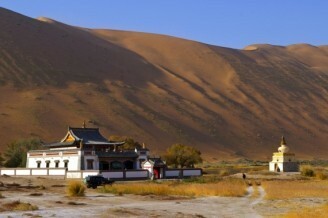 The Badain Jaran Desert has a well-preserved Tibetan-Buddhist temple – Badain Jaran Desert Temple, which was built in 1868. Since the temple lies in the heart of the desert - and, naturally, on the shores of a lake - it has remained untouched by the many wars that have marred or destroyed temples in other parts of the country. Badain Jaran Desert Temple, which measures some 300 square meters, has a modest library, several Buddhist frescoes, statues and wood carvings, as well as brick carvings and several other ancient artifacts related to the history of the temple. There is also a white pagoda standing to the west of the temple proper. 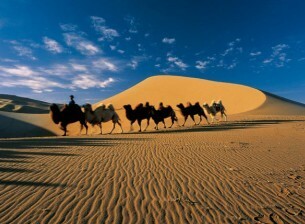 The Badain Jaran Desert is the third-largest desert in China. The Badain Jaran Desert, like the Tengger Desert which lies east of the Badain Jaran Desert (and with which the Badain Jaran is merging, due to desertification in the area), is roughly one-half barren, sandy desert and one-half a mixture of swatches of solid bedrock, swatches of loose gravel (the latter is often referred to as gobi, hence the name of the larger desert to which the Badain Jaran belongs), and several smallish lakes, around which grows limited vegetation. The Badain Jaran Desert is bounded to the north by: the Gobi Desert (gē bì shā mò 戈壁沙漠) proper, which, here, is characterized by blackened gravel, or blackened gobi; to the east by Mount Lang, which separates the Badain Jaran Desert from the Ulan Buh Desert (wū lán bù hé shā mò 乌兰布和沙漠); to the southeast by Mount Yabraishan (yǎ bù lài shān 雅布赖山), which separates the Badain Jaran Desert from the Tengger Desert (téng gé ěr shā mò 腾格尔沙漠); to the southwest by the aforementioned He Xi Corridor; and to the west by the Ruo Shui (ruò shuǐ 弱水) ("Weak", so-named because it sometimes dries up) River, or Ejina River (é jì nà hé 额济纳河), which separates the sandy Badain Jaran Desert from the rocky Taklamakan Desert (tǎ kè lā mǎ gān shā mò 塔克拉玛干沙漠). 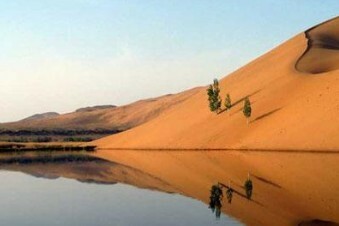 Both the Badain Jaran Desert and the Tengger Deserts belong to the Gobi Desert, which straddles Inner Mongolia and Mongolia proper, is mostly only semi-arid, and is the world's fourth-largest desert. Like other great sand deserts, the Badain Jaran Desert has its remarkable sand dunes whose sharply defined edges bring to mind the swirls of thick icing on a cake, except that the "cake" in question would have to have been of gargantuan proportions. Some of the sand dunes of the Badain Jaran Desert are constantly shifting, as with other large deserts, but Badain Jaran Desert also has a number of sand formations that do not shift, that is, only the shallow surface is loose. Note that the sand dunes that do shift give rise to a number of strange sounds ranging from funny noises (barking, burping, croaking, or squeaking sounds) to eerie, groaning sounds to outright booming sounds (to read more about this strange phenomenon, and to listen to a couple of different such sounds). The phenomenon that gives rise to relatively stable desert sand formations is the following. The subsurface has been compacted over the aeons at the same time as the individual grains of sand have become lightly "glued" together due to repeated moisture levels, especially in earlier times (some 20-30 thousand years ago). This rather rigid subsurface structure is what gives the sand dunes their shapes (in the Badain Jaran Desert, these extremely large sand dunes are referred to as megadunes) that bring to mind mountain features such as peaks, cliffs, gullies and even caves. Known as singing sands, whistling sands, or booming dunes, the dunes of the Badain Jaran Desert make a surprising amount of noise. 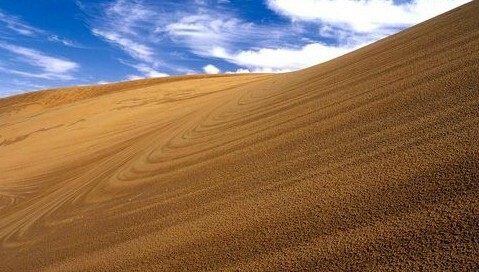 Singing sands are generated when the desert wind pulls the top layer of sand off layer below. It is believed that the noise is generated by electrostatic charge this action creates. On a small scale, such as a beach, this phenomenon creates a high-pitched sound, but on a much larger scale, it can emit a low-pitched rumble or booming sound, and at up to 105 decibels, it can be quite loud. Despite singing sands and booming dunes being a feature shared by some 35 deserts and beaches around the world, the mechanism that makes the sound is still not fully understood. A booming sand dune manifests itself by initiating an avalanche from the leeward face of a large dune. The resulting low-frequency booming noise or music is loud and resembles a low-flying propeller airplane. The sound is surprisingly monotone with one dominant audible frequency. The sound is sustained and may continue for up to a minute after initiation, even after all visible motion has ceased. Moving a hand through the dry sand of a booming dune shears the upper layer and generates another acoustic phenomenon, the burping emission - pulse-like, short bursts of sound. Booming dunes are silent in the wintertime when moisture from precipitation is retained in the dune. The burping property depends on sand grain characteristics and can be generated all year around. In the summer time when the larger dunes produce their music, the smaller dunes in the dune field remain silent. This indicates that structural properties of the dune are critical for the generation of the singing sand. Also, booming can only be generated at slopes at the angle of repose (30 degrees) on the leeward face of dune, the same sand on the shallower windward side cannot generate the music. 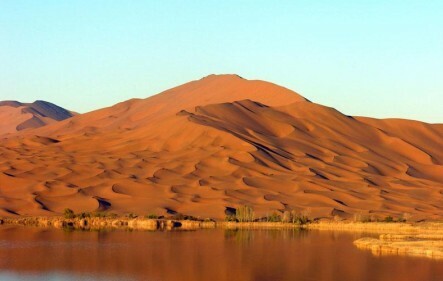 The most famous peak in the Badain Jaran Desert is Bilutu Peak (bì lǔ tú fēng 必鲁图峰), which rises about 500 meters above the surrounding surface. The average Badajilin peak, of which there are numerous, rises about 200 meters above the surrounding terrain. The plateau on which the desert lies, the Alxa Plateau, lies at about 1200 meters above sea level. 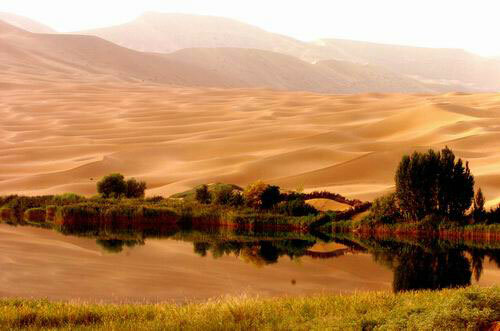 Badain Jaran Desert's peaks, its sand dunes, its lakes and its sacred springs are considered the "Four Treasures of the Badain Jaran Desert". 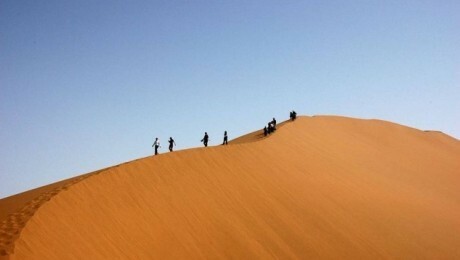 The Badain Jaran Desert is also known as the "King of Sand Dunes". The Badain Jaran Desert, despite its searing heat, is home to some 40 smaller lakes that are of vital importance to the livestock (mainly camels - the ones used for safaris - goats, sheep and some horses) that are tended by the herdsmen who make the Badain Jaran Desert their home. When viewed from a distance, Badain Jaran Desert's lakes appear as tiny oases surrounded by an otherwise arid desert, yet there is quite a lot vegetation, albeit sparsely spaced, that grows even on the sandy desert floor, and on which the livestock thrive. Round about the lakes grow narrow vegetation belts, often with reeds sprouting up in the shallows and providing a temporary perch for foraging birds. Badain Jaran Desert's lakes have been called the "Jiangnan (jiāng nán 江南) of the Desert", Jiangnan being a geographical (but not political, or administrative) term to describe one of China's most fertile old regions, the region just south of the Yangtze River in eastern China (nan means "south" and Jiang ("River") refers to the Jiang of Chang Jiang, or Yangtze River). Not surprisingly, the Badain Jaran Desert's sandscapes are a very popular tourist attraction (don't worry, the tracks you leave in the morning will largely be erased by the evening, thanks to the action of the wind), and present something of a challenge to climbers (make that "crawlers" on the steepest sections), as it is often a case of "two steps upward and one step downward", depending on the steepness of the incline and the looseness of the surface sand. The tourist can also take part in a camel safari, or, if motorized transportation is one's preference, there are 4-WD (think: Land Rover) vehicles. Just as the ship itself was the star of the Hollywood film, Titanic, the desert itself is the star attraction of the Badain Jaran Desert. 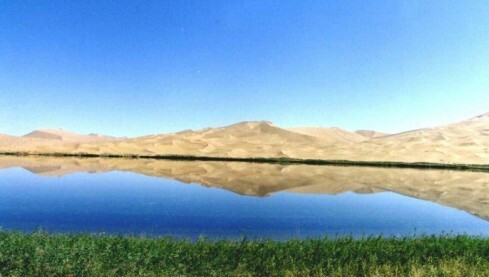 Moreover, Badain Jaran Desert, together with the Tengger Desert and the now dried-up Juyan Lake Basin (jū yán hǎi 居延海) as well as 10 other special, contiguous scenic areas in the region, have been recognized as a unique ecosystem by UNESCO, and have, since August, 2009, been listed as UNESCO's very first Desert Geopark within the UNESCO Global Geoparks Network. * "Tangut" is a term to describe a collection of ethnic groups, including the Tibetans, the original Han Chinese (before they began to absorb other ethnic groups) and the Miao, who lived in northwestern China in the region of present-day Gansu and Shaanxi Provinces, and also in the southwestern corner of Inner Mongolia. This group is sometimes associated with the forefathers of the present-day Qiang ethnic minority (羌族). * This is the very fertile Yangtze River Delta area south of the lower reaches of the Yangtze River, which area, since ancient times, has served as the "bread basket" of China in every sense, from agricultural production to heavy industry to intellectual "output". Even though Jiangnan accounts for only about 5% of China's physical area, it accounts for a disproportionately large part of the country's GDP. The people who reside in this part of China speak a Wu (wú 吴) dialect (from the ancient Kingdom of Wu). The most sublime variant of this dialect is supposed to be spoken in the city of Suzhou (sū zhōu 苏州), while the most representative variant of the dialect is spoken in Shanghai (shàng hǎi 上海). You’d better hire off road vehicles with best drivers. Bring warm clothes with you because it will be cold at night.